Pressure cooker pasta makes life so easy sometimes. 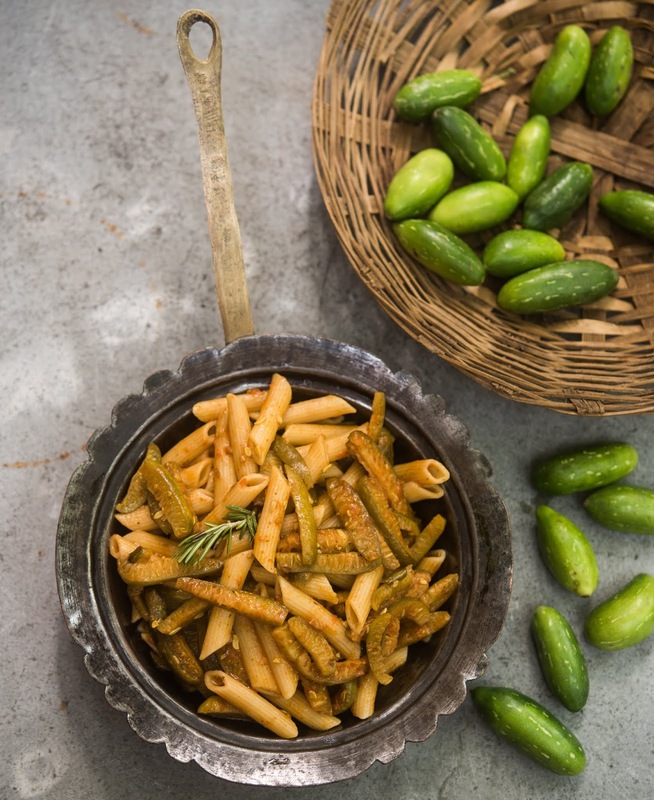 I have shared a basic recipes of pressure cooker pasta with seasonal and local vegetables that includes ivy gourd and this time I decided to use just the ivy gourds for a change. With the herbed tomato sauce the pasta turned out to be so wonderful I tried the same method with cooked chickpeas instead of pasta and loved the result. In fact the flavour comes from the tomato sauce used here, ivy gourds (we call them kundru or tendli) retain their texture and subtle flavour resulting in a deeply satisfying meal. Soak the pasta in 100 ml hot water (or stock if you wish) and few drops of olive oil in a bowl. Keep aside. You need about 10 minutes to chop the ivy gourds so the soaking time is just 10 minutes. Slit the ivy gourds lengthwise into two halves and then slit each half in 4 thin strips. If you are using macaroni you can cut round slices of ivy gourd. Pour the olive oil in a pressure cooker pan (for this quantity using a 2-3 liter capacity pressure cooker is better), add slit garlic, rosemary leaves and cover with the ivy gourd slices. Add salt and toss to mix. Note that the pressure cooker pan is not to be placed on burner before this. Using extra virgin olive oil ensures to benefit from the good flavour of oil and and mixing the ingredients while they are cold is a way to ensure the oil retains its nutritional benefits too. 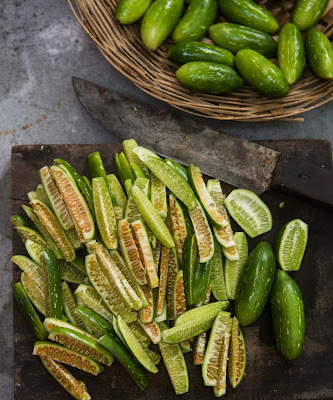 Now place the pressure cooker pan on stove top, keeping the flame medium, and let the ivy gourd slices be cooked while tossing and turning them every couple of minutes. Once the ivy gourd slices start turning pinkish brown you can add the soaked pasta at once, pour the tomato sauce or fresh blended tomatoes with herbs, toss to mix and place the lid on the pressure cooker. Cook till the first whistle blows, switch off the gas stove and let the pressure release on its own. Open the cooker, toss lightly to mix and serve hot or cold. This recipe is great for lunch boxes too as it tastes great even when cold. You can add some feta cheese or parmesan to top the pasta. We often enjoy our pasta without cheese, especially when we have good quality olive oil. This time I brought a few tins of very good extra virgin olive oil from Cyprus, where I had gone for a product development assignment.